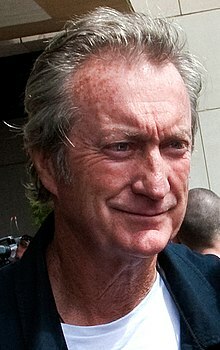 Bryan Neathway Brown, AM (born 23 June 1947) is an Australian actor. He has performed in over eighty film and television projects since the late 1970s, both in his native Australia and abroad. Notable films include Breaker Morant (1980), Give My Regards to Broad Street (1984), F/X (1986), Cocktail (1988), Gorillas in the Mist (1988), F/X2 (1991), Along Came Polly (2004), Australia (2008), Kill Me Three Times (2014) and Gods of Egypt (2016). He was nominated for a Golden Globe Award and an Emmy Award for his performance in the television miniseries The Thorn Birds (1983). It costs a lot of money to release a movie. What you'd call art-house movies - movies that don't have big stars or big budgets - they're very hard for distributors to get behind 'em and take chances. You know, I stumble about what I'm going to do. I don't plan. I've never had ambitions. Look, I've always been a confident bloke. I'm grateful to my mother for that. I wanted to be an actor, and when that day happened that was sort of like the end. Now let it take me. I'm a Sydney suburban boy shaped entirely by the western suburbs. Because I like theatre and I love a challenge. With 'ZEBRA!' I've found a new Australian play where I can create a character first - that's what I live to do.